Bristol Palin and Mark Ballas are headed into Week 6 of Dancing With the Stars tonight. This week they will be dancing the Tango and participating in a rock ‘n roll marathon, which will be a group dance. According to this article (h/t DanceBristolDance), Bristol’s new video with Static Cycle will also premiere today on E!Online. (I found the video here with a 10/24 post date.) Here is the video teaser found on Static Cycle’s official website. Bristol plays the role of Mother Nature in “Inside This World of Mine,” which is available as a free download on the site. Here are some interesting excerpts from Mark Ballas’ DWTS Journal on USA Today (h/t DanceBristolDance) that he posted last week. The best emotion to describe how I feel right now is bittersweet. I can’t explain how great it feels to know that Team Ballin has great fans that pulled us through this week. But it’s a bitter feeling because my dad (pro dancer Corky Ballas, matched with entertainer Florence Henderson) got eliminated. I’m his biggest fan and it makes me really sad that he’s leaving the show. I lost my partner who throws the football around with (retired NFL quarterback) Kurt Warner on Tuesday afternoons. Who’s going to show up (pro dancers) Maks (Chmerkovskiy) and Tony (Dovolani) with me now? Ha! Before Tuesday night’s show, there was an eerie calm backstage. As each week passes, all the contestants know the stakes are raised and the competition stiffens. Up until 30 minutes before the show, I was rehearsing and preparing for my pro dance (more on that later) and trying to keep my mind off the results show nerves.Bristol and I knew we didn’t nail our jive, but we also know our fans have been voting like crazy to keep us on the show. I’m very grateful to our fans! So how about those gorilla suits? How funny was that? The judges keep harping on Bristol to have a better overall performance and play a character, so that’s exactly what they got! We had great fun with all the shots of us backstage, jumping on couches and beating our chests, and the fact that we pulled off dancing in gorilla suits will be remembered for years! This week, we have two dances and Bristol’s really nervous. Both are going well, though. Our first dance is the tango and Bristol’s picking it up better than I expected her to, and I had high expectations! It’s similar to quick step, which was her best dance so far, so expect us to do really well on Monday. The rock n’ roll marathon is the second dance, and it’s elimination style. If you last until the end you dance for four minutes straight, which is a really long time to dance! My dad’s (pro dancer Corky Ballas, who was eliminated with partner Florence Henderson this week) holding up well since he was eliminated. He had a great time hitting the talk-show circuit this week, and got to hang out with Elton John on The View Thursday. In my last entry I forgot to mention just how terrific Florence is. Her send-off speech Tuesday was so classy and one of the nicest that I’ve heard. She truly gave a huge compliment to all of us with her kind words, given her long career in show business. My mum (Shirley Ballas ) gets back from England today and I’m really excited to see her. She’s been gone almost three weeks training her dance students in the United Kingdom. We usually see each other every day, so it seems like forever since I’ve seen her. One of the charities that is very dear to my heart, The American Foundation for Suicide Prevention, is having their annual charity walk in Santa Monica Saturday. I’m performing one of my songs to warm up the crowd, and my family has a team that is walking. I lost my uncle to suicide seven years ago so I do everything I can to spread awareness about suicide. 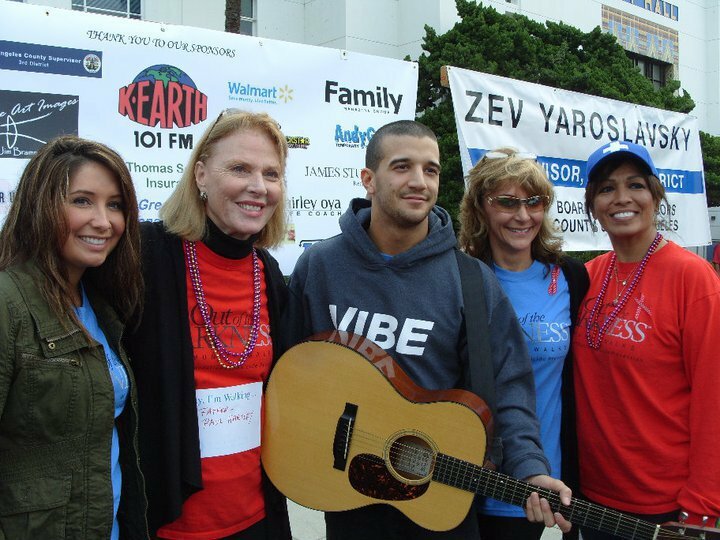 Thursday morning, I performed on Gary Bryan’s morning show on KEarth 101 in southern California to promote the walk. Time to get back to workin’ it with Bristol. While I was catching up on the latest Bristol news at DanceBristolDance, I spotted a link to this video of Bristol and Mark being interviewed at the Los Angeles Kings hockey game, which we mentioned here last week. From all appearances, Bristol and Mark have focused primarily on rehearsals for DWTS Week 6 over the past week. Mark’s journal entry indicates these have gone well and that we can expect another outstanding performance tonight. Be sure to tune in and vote, vote, vote for Bristol and Mark! As a reminder, you can vote by phone by calling 1-800-868-3407 or by texting 3407. Voting online can be done at the Dancing With the Stars Voting Page. Voting by phone is open from the start of the show until 30 minutes after the show ends. Online voting is open from 8 PM EST on Monday night until 11 AM EST Tuesday morning. You can use your Facebook, MySpace, Twitter, and personal e-mail accounts to vote. There is more information about voting at VOTING — HOW IT WORKS. As you know, our votes are factored in with the judge’s scores. We know Bristol and Mark’s performance will be outstanding, so let’s do our part to help them win!